This is a replacement throttle body for the EMPI 40K 40mm carburetors. It will NOT work properly with Kadron Solex H40/44EIS carbs, but is a great replacement for the EMPI 40K's. 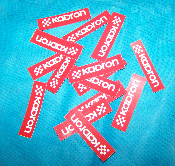 For the correct Kadron replacement, use #187802. Our linkage is brand new original style linkage, now made by EMPI. 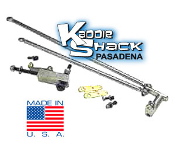 It comes with the hold pre-driled and tapped for the optional metal fuel rails (sold separately), Reproduction vintage style Kadron logo on the bellcrank optional for an additional $5. Fits Type 1 engines only. Quality washable new air cleaners with all mounting hardware. These are the steel-backed teflon-coated bronze bushings that we use to re-bush the throttle bodies on the Kadron Solex H40/44EIS carbs. 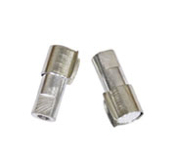 These are the very best quality bushings in the industry, and if done correctly, they will far outlast the... Did you lose or damage an air cleaner lid? Here is a replacement that won't break the bank. This lid does have minor blemishes such as small dent, scratch, or pitting in the finish so it didn't make the cut as a new lid, but it's probably better than the one you have! Did you lose or damage an air cleaner base? Here is a replacement that won't break the bank. 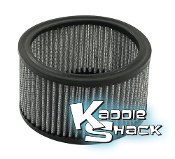 This high quality filter is reusable and will last for years. Keep it oiled with air filter oil. This filter replaces the original paper elements that came inside the early "can" filter housings. Sold each. We prefer installing these thick paper gaskts between the intake manifold and the cylinder head for best sealing of your Kadron Solex H40/44EIS carbs, any dual carb system, or even to replace the stock metal intake gaskets on your stock carb. 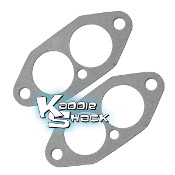 These super thick gaskets have an oversized footprint, making them perfect for match-porting your intake manifolds to your performance ported cylinder heads. Sold in pairs. 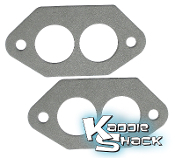 These gaskets are installed between the base of the carburetor and the intake manifold to ensure a leak-free installation. Sold in pairs. Use this to spruce up your new or old linkage. This linkage, while not perfect by any means, might be just the ticket for you. This includes the bellcrank, the crossbar (might be one-piece or two-piece), and the offset connecting link. Although not shown in the photo, it does include the ball... This is the linkage we use for Type 4 engines in 72 and up buses and Porsch 914's. Make sure that you not only have the proper linkage and manifolds, make sure your jetting and venturi specs are up to snuff, as well. Type 4 motor require special jetting to maximize efficiency. 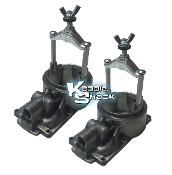 Type 2/4 Intake Manifold Kit. Use with 40mm and 44mm Kaddies. Comes complete with all necessary hardware and gaskets. 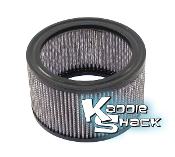 Use these cork base under the air cleaners for either the early style air cleaners, or the later style, to prevent dirt and dust from entering your carb. 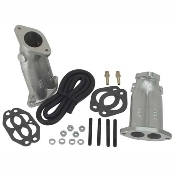 This kit will supply you with mounting studs and nuts for two carbs to mount on steel intake manifolds, single or dual port. Replacement ends for worn out linkage. Sold in pairs and comes with the clips. Tired of your linkage jumping off the balls? These ends may fix the issue. If not, upgrade to our heim joint USA linkage and end the problem forever. The older Kadron Solex H40/44EIS carburetors came from the factory with an awful metal double nut set up on the acceleratpr pump drive rods. These were next to impossible to get to to make adjustments on most cars. Later, they began coming... 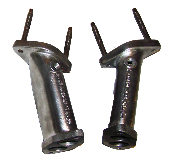 FINALLY - We have replacement accelerator pump discharge nozzles available. In the past, when this nozzle cracked or was broken, there was no other option than to throw the carb in the trash or use it for parts. Nozzles fit all vintages of Kadrons. Did you misplace your float pin retainer/spacer? We have a supply of used ones in good condition. Don't try and use a matchstick, safety pin, or something else that risks having your float get stuck and filling your engine with gasoline.